EASTER SALE - BIS - ENDING SOON! EASTER SALE - Chandos - ENDING SOON! EASTER SALE - Hyperion - ENDING SOON! This despatch estimate is based on information from both our own stock and the UK supplier's stock. If ordering multiple items, we will aim to send everything together so the longest despatch estimate will apply to the complete order. If you would rather receive certain items more quickly, please place them on a separate order. If any unexpected delays occur, we will keep you informed of progress via email and not allow other items on the order to be held up. If you would prefer to receive everything together regardless of any delay, please let us know via email. Pre-orders will be despatched as close as possible to the release date. 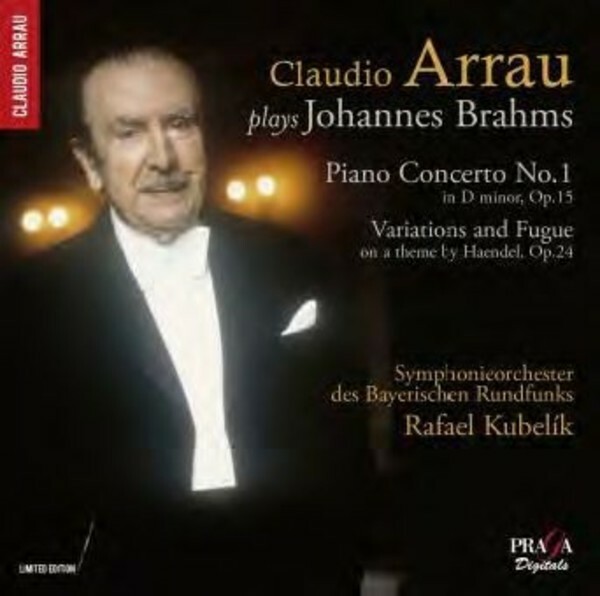 Having won particular fame as a great Beethoven interpreter, Claudio Arrau was no less celebrated for his Brahms. The First Concerto he recorded for Philips with Bernard and the Concertgebouw, with Giulini and the Philharmonia [EMI] and in a live recording with Rafael Kubelik from 1962 on Orfeo d'Or. Here he is accompanied by Bavarian Radio Symphony Orchestra under Kubel�k, with whom he had a particularly deep understanding. Arrau's recital programmes included the Brahms' Paganini and Handel variations as far back as the 1920s, and while he continued featuring the Paganini variations for many years, he had a more enduring association with the Handel variations which was a staple of his recitals right through the 1960s, and which Donald Tovey appropriately ranked as one of "the half-dozen greatest sets of variations ever written".